Financial services are a global industry, and Ulatus can ensure that you are able to work with clients and investors in any language. We offer localization services specialized for all aspects of finance, and with Ulatus’ track record of high quality, confidentiality, and rapid turnaround, you can trust us to meet your needs. Ulatus’ financial sector localization services provide a wealth of critical translation and linguistic services to companies operating in all realms of finance. Whether investment or commercial banking, asset management, insurance, or beyond, we are proud to offer you services geared towards expanding the reach of your business to the entire globe. The international, 24x7 reach of the financial sector means that business and opportunities are crossing borders and presenting themselves in multiple languages with more frequency than ever before. Being restricted to a single language limits everything from your potential client base to the ability to manage personnel in other territories. 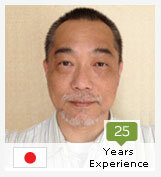 This translator has over 25 years of experience as English to Japanese translator and writer. 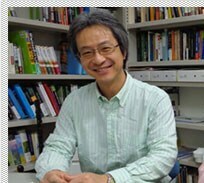 He has translated several guides, promotional videos, websites, and manuals. 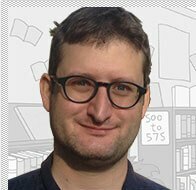 He worked with ASCII Corporation, Tokyo as a translator of software manuals and also as a writer for their weekly and monthly magazine. He has worked on several localization projects of Microsoft, McAfee, and Intel. This translator holds a master’s degree in public relations and has more than 15 years of extensive experience in translating various formats of materials from Eng-lish to Chinese and vice versa. She specializes in finance, legal, medical, consumer, travel, and IT related articles, as well as in documents of journal-istic translation, advertising, marketing and promo-tional materials. 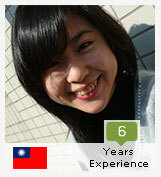 She is well-versed in Trados, Chi-nese Word Processing, MS Office, and other technical platforms. In her acclaimed career, she has also offered other forms of translation services like transcreation, transcription, subtitle services, review mother-tongue text, revise junior translator’s translation, among others. 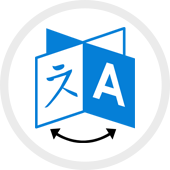 This translation checker has over 10 years of experience in translating documents from a wide range of subject areas. She holds a Master’s in Creative Writing. Her past experience includes Interpreter and Translator for firms such as AIG ALICO Japan, Citigroup Japan, and Sony Corporation. MA Creative Writing, Kingston University, UK. BA Law, Hosei University, Japan. BA Speech Communications, San Francisco State University, USA. AA, Linguistics (Hons), Foothill College, USA. Interpreter and Translator for AIG ALICO Japan for meetings and magazine articles. Interpreter and Translator for Citigroup Japan for trainings, laws and regulations. Interpreter and Translator for Sony Corporation for Technical specifications. Interpreter and Translator for Pacific Golf Management for documents and meetings. Interpreter and Translator for Japan Tobacco Inc. for presentation materials. English to Japanese Translation . Japanese to English Translation . English to Japanese Interpretation. Japanese to English Interpretation. 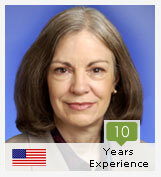 This translator has more than 10 years of translation experience. She is a Brazilian native and currently resides in Brazil. She has extensive translation and interpretation experience in socioeconomics and communications. She is fluently bilingual and is skilled in Portuguese to English and English to Portuguese translation and interpreting. BA Social Communications – Specialized in Marketing and Advertisement, Universidade Estácio de Sá, Brazil. Teaching English as a Foreign Language, RSA/UCLES CTEFLA, Stanton School of English – London, England. 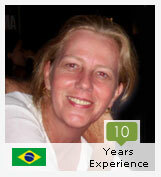 Has worked as a freelance translator for many companies in Brazil, USA, and Europe. Activities Director, IB CAS Coordinator and Community Service Coordinator,American School of Rio de Janeiro (EARJ) – Rio de Janeiro, Brazil. -	Responsible for organizing events parties, fairs, and congresses; planning and organizing national and international trips; fundraising for social projects; financial management, planning and execution of projects; creation of advertising material; obtaining sponsors; translation of official and financial documents. Educational Secretary,International School of Curitiba (ISC) – Curitiba, Brazil. - Responsible for all legal aspects of the school with the Ministry of Education within the Brazilian system. English Teacher,Mayfair School of English – London, England. Personal Assistant to the Director,Global Management Services – Tenerife, Canary Islands. An MBA graduate from the Wharton School, this translator is a multi-talented finance professional with a decade’s experience in translation in the stream of finance. She has also served in high positions across top financial institutions in the United States and has extensive knowledge of Japanese business and financial markets. -	Director, Standard & Poor’s Ratings Services, New York, NY. -	Managing Director – Credit, Natixis Capital Markets, New York, NY. 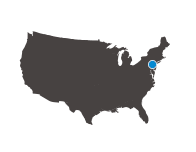 -	Vice President - Fixed Income Research, Credit Suisse First Boston, New York, NY	. -	Vice President-Senior Credit Officer, Financial Institutions Group, New York, NY. 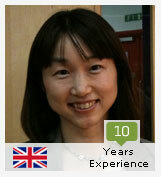 -	Senior Analyst, Research & Information Department, County NatWest Securities, Tokyo, Japan. -	Assistant Manager, English Publications Department, Japan Echo Inc., Tokyo, Japan. -	Translated various books on Japanese Bookbinding styles and published by Weatherhill, Tokyo. -	Translated and edited articles for Japan Echo Inc.’s, flagship publication, ‘Japan Echo’ and other documents for corporate and government clients. -	Translation manager for Economic Eye, a quarterly English-language publication of the Keidanren (Japan Business Federation) during tenure at Japan Echo Inc. -	Translator/Editor, Simul International, Inc., Tokyo, Japan. -	Associate member, American Translators Association. 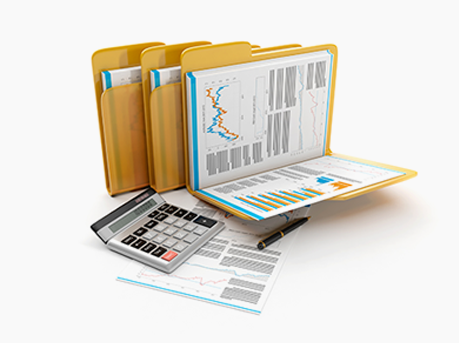 -	Standard & Poor’s Certified Credit Ratings Analyst for Corporate and Financial Institutions Ratings. -	Frequent guest commentator on CNN, Reuters TV, CNBC, on the Japanese economy and financial markets. -	Occasional quotes in finance related media reports such as Dow Jones Wire Service, Reuters, Bloomberg, Australian Financial Review, Sydney Morning Herald, The Age, Asian Wall Street Journal and Financial Times. -	Occasional quotes in the Australian financial press. She holds a master’s degree in translation studies and has 6 years of experience in English to Chinese translation and vice versa. She specializes in a variety of genres including business communication, marketing, tourism materials, website translation, and more. Because of her prior work experiences in customer service operations, she possesses an excellent communication skills, both verbal and written. Consecutive Interpreting, Taiwan . News reading, Taiwan . English News Training, Taiwan . Reading Comprehension & Translation, Taiwan. English to Traditional Chinese Translation . Traditional Chinese to English Translation . English to Chinese Interpretation . Chinese to English Interpretation.